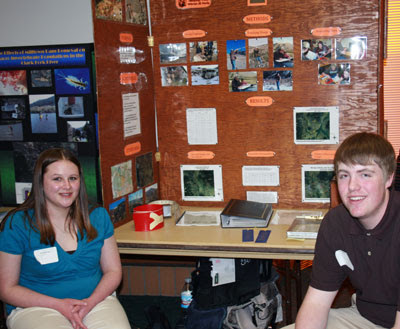 Inadvertently left out of the last Restoration and Education Newsletter issue were Butte High science fair superstars, Chris Doyle and Danielle Bay. The two senior Bulldogs have worked the past two years radio-tracking a herd of transplanted bighorn sheep in The Highlands mountains south of Butte. The team won top honors in their category at both the Southwest Montana Regional and Montana State Science fairs. These gold medals advance Doyle and Bay to the International Science & Engineering Fair, to be held in Reno, NV later this month (we'll keep you posted on how they fare!). Following is a guest blog written by their equally all-star studded scientist mentor, FWP biologist Vanna Boccadorri. 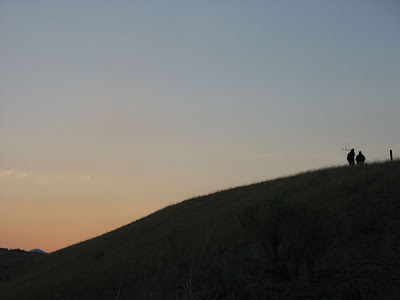 The project has been a huge success due to the above-and-beyond efforts of Boccadori, not to mention very key support from the International Elecrical and Electronics Enigneers (IEEE) Butte Chapter and the Foundation for North American Wild Sheep (FNAWS). Thanks to all and CONGRATULATIONS, CHRIS AND DANIELLE...and VANNA! “Once upon a time in a land not so far away, there were some bighorn sheep wearing radio collars that were transplanted to the Highland Mountains, south of Butte, MT….”. Okay, while this is not a fairy tale, it is a story with a happy ending. Four years ago I became the Butte Area Wildlife Biologist for Montana Fish, Wildlife and Parks. In addition to managing the wildlife in one of the most beautiful corners of Montana, I was also handed the responsibility of managing the Highlands bighorn sheep herd, whose range included the Highlands and East Pioneer Mountains. The Highlands herd, as it is popularly known, was once a thriving population of bighorn sheep known for its abundance of trophy rams. Unfortunately, in the mid 1990’s, the herd suffered an all-age die-off that left less than one hundred surviving individuals. Since then, the herd has struggled to rebuild itself. In an effort to help the population along, the management decision was made to relocate sheep to the Highlands. 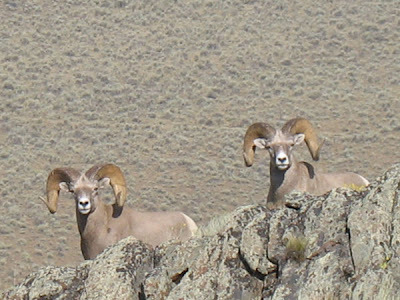 In February 2007, seventeen bighorn sheep were transplanted from the Ruby Mountains and in January 2008, sixty-five sheep were transplanted from the Sun River herd. Amongst these, radio collars were placed on twenty-five adult ewes so that their post-release movements could be monitored. A big thanks to Montana FNAWS for funding a portion of the collars as well as some of the capture expense (along with the National FNAWS and several other state chapters). After the first transplant, an article appeared in the local paper describing the event, including mention of the fact that some of the sheep were radio-collared so that they could be tracked. Enter Matt Vincent, director of the Clark Fork Watershed Educational Program (CFWEP). CFWEP is a nonprofit, place-based, hands-on science program for local school kids aimed at instilling an understanding and appreciation of their local environment. Matt stopped by my office after reading the article and asked if there was a way to involve local high school kids in tracking the sheep. Sounded reasonable to me – more eyes and ears out there checking on the sheep, plus fresher legs than mine climbing up and down mountains in search of those nimble critters. It didn’t take much effort to recruit more than a dozen high school students and several of their science teachers to sign up for what quickly became known simply as “The Sheep Project”. So in March 2007, I and wildlife manager Kurt Alt spent a day in the field training the students and their teachers how to track the radio-collared sheep using telemetry equipment, how to map sheep locations on topographical maps, and how to collect group composition and habitat data. The students were then organized into groups, with teachers, CFWEP staff, myself, an FWP wildlife technician, and occasionally parents, serving as chaperones. Each weekend, a group of volunteer trackers would grab the box of tracking supplies from my office and head to the hills, tracking sheep and gathering useful data. Over the past two years, the students and chaperones have logged more than 150 tracker days, more than 20 students spent at least one day in the field tracking sheep, more than half of those students stayed involved with the project for at least one year, and four students stayed involved for both years of the project. Three of these student trackers went on to get seasonal employment with FWP and several of them helped me at check stations in the fall. Two Butte High students, Danielle Bay and Chris Doyle, who have been with the project since its beginning, when they were sophomores, asked if they could use the data we’d been collecting to put together a project for Science Fair. So this past winter, I worked with Chris and Danielle, now seniors, to compile and analyze the bighorn sheep data in order to address the hypotheses of their study. The result was a 40-page report and a knock-out display board that earned them not only first place at both the regional and state level, but also garnered them scholarship money and the grand prize of an all-expense paid trip to Reno, NV in May to compete at the national Science Fair. Overall, The Sheep Project has been a successful endeavor in that much more monitoring of the sheep occurred than if I was doing it myself, and several local students and teachers now have a much greater awareness of bighorn sheep and are likely to keep this interest for their lifetime and share it with others. I owe a sincere thanks to all the volunteers on the project, Matt Vincent and his CFWEP staff, FWP folks who helped out, and the MT-FNAWS Board, especially Casey Johnston! Montana Chapter FNAWS has been incredibly supportive of the Highlands Sheep Project and the involvement with the students. They invited Chris and Danielle to present their study at the annual banquet in Bozeman this past March, and generously allowed me to auction off a day in the field tracking sheep with the students, with 100% of the bid to go directly back to this project. Even more generous, MT-FNAWS matched the high bid of $450 (paid by an equally generous couple from Colstrip) so now there is $900 earmarked for the continuation of the Sheep Project. This money will go towards reimbursing the students for gas money for their vehicles when they are tracking sheep, and other needed supplies. Out of gratitude for all the support MT-FNAWS has given the Highlands Sheep Project, four of the students became new members of the Chapter this year. Moving forward, the Highlands Sheep Project will continue, providing a venue for local students to grow their appreciation and interest in the Highlands bighorn sheep herd. I will step out of the role as project leader and hand this duty over to Matt Vincent and his staff at CFWEP, who are better equipped than I to handle the logistics of the project and keep it going. This will allow me to focus on other aspects of the Highlands sheep management that require more rigorous attention. I will stay involved with the Sheep Project as a “technical advisor”, providing management perspective and context to future student research and Science Fair projects. I look forward to many more productive years working with MT-FNAWS to put sheep and students on the mountain!